This time, the fast food chain is using AR to roast competitors. They say there's no such thing as a free lunch, but the latest promo from Burger King gets you pretty close. Instead of exchanging boring old money for a burger, peckish punters in Brazil can claim a free Whopper by firing up the Burger King app and using it to 'burn' its rival's ads. Don't worry, nothing's being lit up for real. 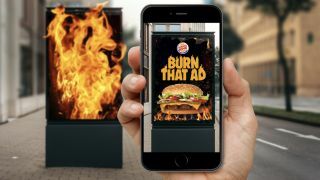 Instead, the 'Burn That Ad' campaign uses augmented reality to roast Burger King's competition. Users simply point their smartphones at promotional material from BK's rivals – including flyers and billboard ads – and watch as they curl up in flames. Once the digital fire dies down, users are presented with a Burger King ad that lets them know they've got a free Whopper waiting for them at the nearest outlet. It's all part of a campaign exclusive to Brazil that publicises how customers can use BK Express to pre-order their meals on their phones to beat queues. "Technology as a means to provide the best customer experience is one of our main investment targets in 2019," says Burger King's marketing and sales director for Brazil, Ariel Grunkraut. "To create the BK Express experience, our exclusive payment technology via mobile phone available all around Brazil, we offer some fun interaction in augmented reality for our brand's lovers through the app. And those using the service also gets a free Whopper." Created and developed by David SP, the 'Burn That Ad' promo is the latest in a string of edgy and out-there campaigns from Burger King. Previous adverts to have pushed the envelope include a Super Bowl spot that saw footage of Andy Warhol chowing down on a Burger King meal (read more about that here). However, this latest campaign sticks to Burger King's habit of going after its competition directly. Late last year, Burger King sent customers to its rival McDonald's in a cheeky campaign that saw participants claim a Whopper for one cent. By heading to the golden arches, app users once again got to unlock a bargain burger. And not even KFC is safe from BK's shade, as Burger King has also launched the King Flame Grilling range, aka K.F.G. Taking swings at its direct competition doesn't seem to be enough for Burger King though, as earlier this month it even went after Starbucks. Customers in need of caffeine have been invited to use the BK app (spot the theme) to sign up to a BK Café Coffee subscription. This deal sees people pay $5 a month to get a small Arabica coffee every day at participating Burger King stores. And to promote the deal, Burger King is keen to point out exactly how these numbers break down: "Enjoy BK Café for a month for the price of a large cappuccino from Starbucks." Ouch. While these campaigns are admittedly clever and witty, the relentlessness of jabs at its competition is making Burger King look like the eatery of edgelords. Where will its reign of terror end?